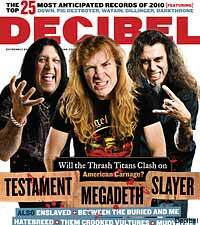 With the American Carnage Tour -- featuring titans Megadeth, Slayer and Testament on one bill that is so metallic that it could crap iron ore, currently postponed -- extreme metal mag Decibel prepared for the tour by studding the cover of their February issue with Megadeth's Dave Mustaine, Slayer's Tom Araya and Testament's Chuck Billy. The issue is on stands now and takes an in-depth look at the strong, thrashing personalities. Decibel editor-in-chief Albert Mudrian told Noisecreep, "OK, maybe I'm a little nostalgic about this cover. When ever I look at it, I feel like I'm 15-years-old again! That's because the studio LPs that Testament, Megadeth and Slayer released in 1990 still rank as my personal favorite album from each band to this day." Furthermore, Mudrian said, "As for the American Carnage Tour, I've heard some rumors that Megadeth and Slayer were considering selecting a sizable portion of their set lists from the records they were promoting the last time the bands toured together back in '91. So, even the thought of hearing copious amounts of 'Rust in Peace' and 'Seasons in the Abyss,' plus just about any track from 'Souls of Black' makes me wanna break out some white high-tops with oversized tongues! But definitely not these." The editor also admitted that the tour/cover don't simply play to nostalgic warm fuzzies! All three bands are as relevant as ever, putting out quality music three decades into their respective careers. "It also doesn't hurt that the latest releases from all three bands -- 'The Formation of Damnation,' 'Endgame' and 'World Painted Blood' -- are perhaps each band's strongest effort in 20 years! So maybe I don't really need to feel that nostalgic after all," Mudrian said. With tour being postponed, perhaps this issue will become a cult, collector's item?